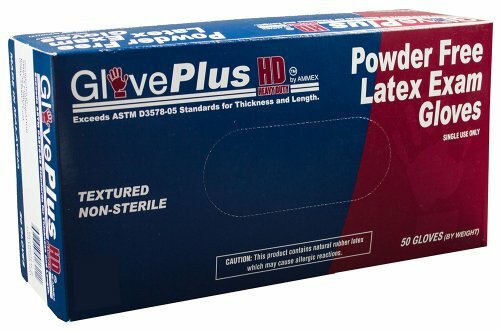 GlovePlus Heavy Duty Exam Grade Latex Powder Free Gloves have palm thickness of 12 mils and it is 12" long from the tip of the middle finger to the edge of the beaded cuff, which extends to cover the wrist and lower forearm. Latex provides better elasticity than nitrile, chloroprene, or vinyl and better puncture resistance than vinyl. This glove is suitable for the healthcare industry and for use in non-surgical medical procedures. The glove is textured on the fingertips, fingers and palm for improved grip compared to a glove with textured fingers, particularly in wet environments. This powder-free glove leaves no residue, reducing the risk of contamination compared to a powdered glove, making it suitable use for emergency responder, in electronic components, forensic and laboratory applications. The color of this ambidextrous glove is blue.